Welcome to this site, dedicated to the Maoming Welfare Institute in Southern China. MWI was established in 1981 and cares for children ranging in age from newborn to early teens who, due to various circumstances, are in need of families. MWI is one of over 200 Chinese orphanages which, since 1994, has taken part in international adoption. 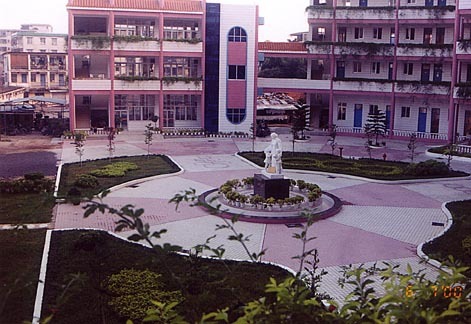 In November 1999, after much hard work, the new building housing MWI was opened. The new location covering nearly 7000 square meters, includes room for a daycare center, several beds for senior citizens and rooms for the children who await adoption with a total of 300 bedrooms. There is also a medical clinic with eight doctors which serves both MWI and the local community. 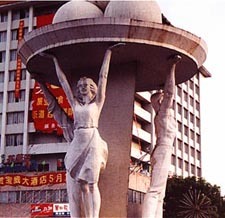 Maoming is a 6 hour train ride from Guangzhou, formerly "Canton". The climate is subtropical for the most part with rolling hills, farmland, mining camps, duck and fish farms. Maoming is known for it's petrochemical business with shipping also significant to the economy due to the closeness of the South China Sea. The population is approximately 600,000. The Chinese characters on the background say Mao Ming. Please email maomingmom@swbell.net if you would like to add information to this site. Our tile for the Hands of Hope Wall fundraiser. The wall is to be built in Beijing, PRC. Note: MaoNan and MaoGang in Maoming are different orphanages. There is a Yahoo Group for MaoNan. 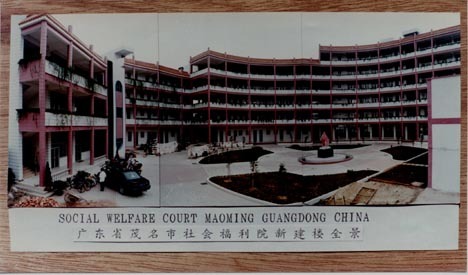 MWI is well-known for the great care that is given to the children and is considered a model orphanage in China. The parents of "Maomingsters" are very grateful for the loving care that the 55 caregivers and staff have given our children. 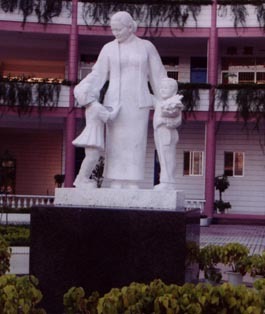 Welcoming visitors to the MWI courtyard is a statue honoring Soong Ching-ling - Madame Sun Yat-sen, (who is loved as the "mother of China").